In recent years, extensive research has popularized the importance or what we eat and how it affects our overall health from personal to environmental impacts. Did you know that when and how you eat also plays a role in your digestive and overall health? Scheduling your meals in consideration of what, when and how can take your health and your body to the next level. Below you’ll see a plant-based schedule that was designed by your wellness ambassadors at Raw Republic to acheive optimum health results! Read our info that follows to uncover some of the reasons as to why we designed it this way. Note to those mid-morning risers: If you start your day later than 6 AM, simply make a mental note to adjust these time frames accordingly. According to the research from Mayo Clinic it is best to eat your breakfast between one to two hours before your workout if you exercise in the morning. Eating ahead of time not only enhances your high-level performance, it also prevents you from tiring during a workout as supposed to eating a bigger meal right before the workout. Since blood sugar and glycogen stores are lowered during sleep, it will require more energy to digest the food and hinder the optimal performance at the gym. If weight loss is your aim, it is best to eat breakfast after your workout, however we still strongly recommend that you intake a light and low glycemic snack prior. For example, a light protein shake or a plant-based protein snack with a side of berries. After a night’s fast the body tends to use whatever energy is available, which means whatever carbohydrate and their conversion from protein, muscle, and fat. If someone is exercising on an empty stomach, they might not have enough energy to perform a quality workout either. You can always have healthy snacks in between meals like berries, veggies, guacamole, a handful of nuts, kale chips, or a smoothie based on your level of hunger or cravings. Otherwise, wait approximately 2 hours in between meals for the digestive tract to rest. Drinking cold pressed juice and fueling your body with its dense nutritional value can also constitute as a snack. The goal is not to fully satisfy your hunger, but to tide you over until the next meal. Look out for our new line of snacks! To join our delicious and extremely addictive (in a healthy way of course) Macadamia Nut Cheddar Squares, we are excited to soon welcome our line of superfood enhanced dehydrated goodies: Raw Cacao Nibs & Bee Pollen Maple Walnuts, Camu-Camu Himalayan Sea-Salt Smoked Almonds, Curry & Turmeric Cashews, Cilantro Lime Pumpkin & Hemp Seeds, Flat Onion Bread (despite its name this treat is anything but flat; rather bursting with flavor), and Sweet Onion Rings! Taking a lunch break is not only important to maintain a healthy digestive system, it is also nourishing for the brain. Taking the focus off of work to eat your meal will give you some rest and help you revamp your energy levels which as result, will lead to better work performance in the afternoon. Try to eat lunch sometime around 12:00 p.m.- 1:00 p.m. Meal ideas for lunch should contain: a vegan protein (feel free to reference our blog on plant based protein linked here), a complex carb, leafy greens and vegetables. We suggest eating more raw vegetables and leafy greens with this meal. 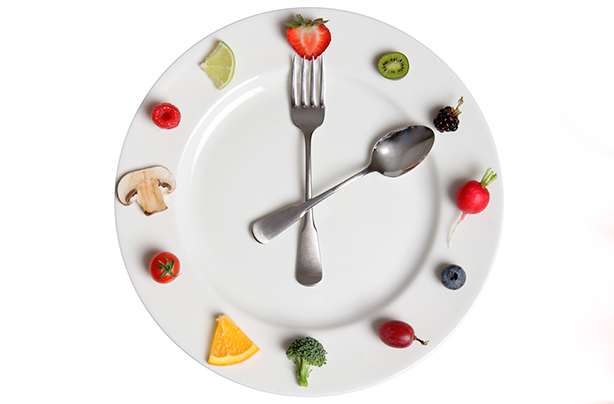 The best time to eat your last meal for the day is no less than 3 hours before you go to bedtime, ideally around 6:00 p.m. This allows your body ample time to digest food before a restful sleep. According to research, if we eat too close to bedtime it will increase blood sugar and insulin, which can result in a difficult time to fall asleep. Meal ideas for dinner should resemble lunch: a vegan protein, a complex carb, leafy greens and vegetables. We suggest eating more warm vegetables and leafy greens with this meal, as well hearty soups and pseudograins like quinoa and buckwheat. When eating food take your time to chew it thoroughly. It is best to not talk with your mouth full, or cause distraction which can lead to overeating. Connect with your meal and use your hands when it makes sense to do so, it is where digestion begins! The same goes with drinking beverages, sip slowly. It also helps to have appreciation for the meal you are about to eat. Imagine the journey your ingredients had taken to end up as your meal, and what a blessing it is to have it ready for your nourishment!